Thanks mserf! let´s keep up painting and trying new things! thanks so much!! have some more Flamenco to post, they´ll be on the site soon! Your technique is soooo nice!!!! This is so expressive portrait!!! thanks! this technique is easier than what it seems and when it works, looks very nice, thanks! Thanks I did this with a painting knife, it is really fun to do, I can recomend it! muy bien tu español y muy buena tu galería! merci beacoup, i m so happy you like it! passe une bonne journee! 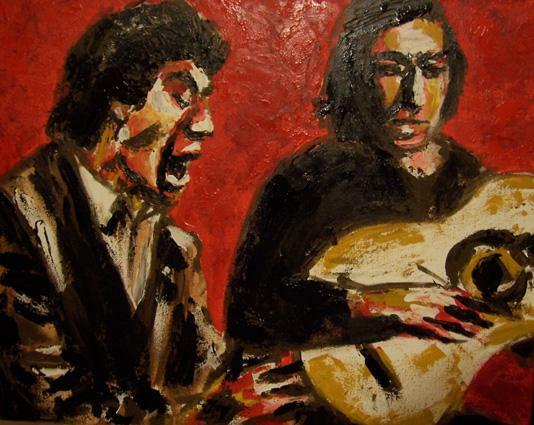 i have some other Flamenco paintings coming soon out of the owen, i´ll keep you posted! more Flamenco pics online now! I hope you like them!